Waves move energy from one place to another. In a progressive wave the wave front moves through the medium. 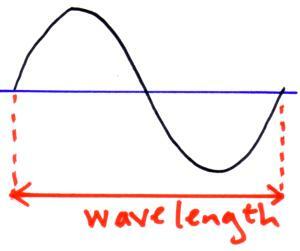 There are two types of waves, transverse and longitudinal. Transverse waves are waves where the displacement of the particles in the medium is perpendicular to the direction the wave is travelling in. Longitudinal waves are waves where the displacement of the particles in the the same direction as the wave is travelling in. 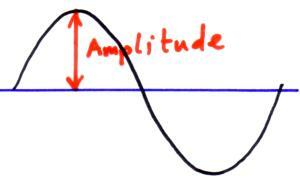 Amplitude (A) is the maximum displacement of a particle in a wave from its equilibrium position. It is measured in metres (m). Frequency (f) is the number of complete waves passing a point in one second. It is measured in hertz (Hz). Wavelength (?) is the distance between two identical points on a wave (i.e. one full wave). It is measured in metres (m). Wave speed (c) is measured in metres per second (ms-1). Wave speed (c), frequency (f) and wavelength (l) are linked together in the following equation. Points on a wave which are always travelling in the same direction, rising a falling together, are in phase with each other. Points on a wave which are always traveling in opposite directions to each other, one is rising while the other is falling, are in antiphase with each other. If we measure the distance travelled by two waves and then compare those distances, any difference in the distances travelled is called the path difference. Path difference is measured in metres (m).